Aerial photography is awesome. A near-sighted drone that is unable to clearly see distant objects is a bummer. The utility of drone photography is directly related to whether important details are discernable in the imagery. The “resolving power” of your drone (a “flying camera system”) is a key consideration. It is imperative to understand resolving power’s impact on your drone deliverables. Figure 1. Typical target used to measure resolving power of a camera system. The more lines that can be distinguished from one another as they get smaller and closer together gives an objective measurement of resolving power. 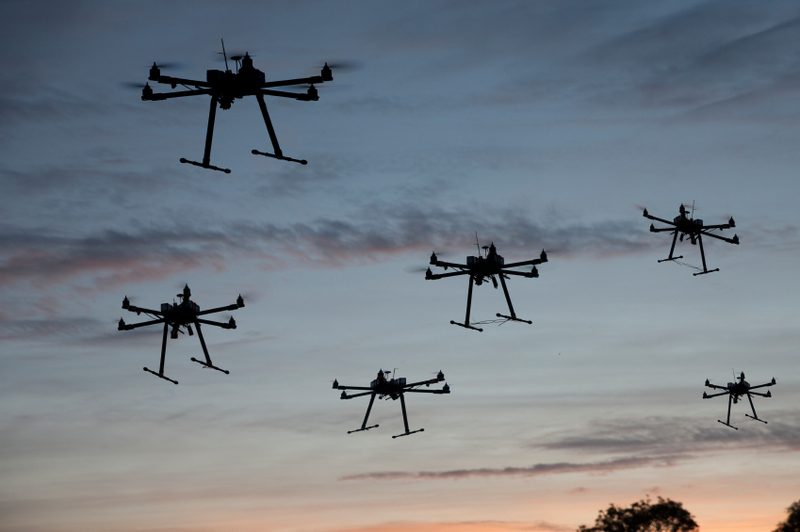 Drones (aka “flying cameras”) operate in an inherently unstable atmosphere under constant, random motion where lighting conditions can vary continuously and dramatically. Resolving power is a measure of how much detail is discernable in photography (Figure 1). The ultimate resolving power is a product of not only the quality of the camera and lens but also the performance of the entire “camera system”. These and other factors affect the ultimate detail visible in drone photography. Clarity of detail is often needed to accurately measure or map visible features. Clarity (high resolving power) also has a direct impact on the ultimate positional accuracy of the orthophotography generated from the aerial photography. 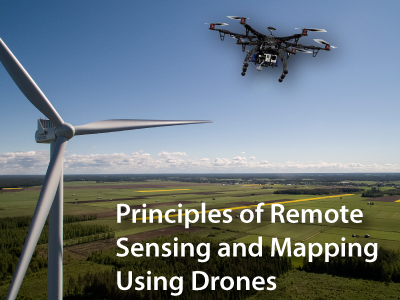 As budding new drone operators or consumers of these professional services we need to understand these fundamentals of remote sensing and mapping. Camera Motion. Perhaps the most significant factor that can destroy the resolving power of the “camera system” is motion. If a camera is moving at the moment of exposure, the photo is blurred. Resolving power is lost. The more rapid the camera motion, the more blur and the less resolving power. Less and less detail is visible as resolving power is lost. In our traditional aerial camera systems made for manned aircraft we often incorporate special features called forward motion compensators. These effectively “push” the camera backward (opposite the direction of travel) at the instant of exposure. This greatly reduces forward motion of the camera and subsequent blurring of the image. Today’s drones do not have these capabilities. To make matters worse, as the camera flies closer to the ground the blurring effect becomes even more pronounced at a given speed. We typically are flying drones at below 400’ AGL where blurring is a real problem compared to our manned aircraft that rarely fly below 1500’ AGL. Without forward motion compensators, there is little that can be done to minimize this loss of resolving power caused by the forward motion of the flying camera. Figure 2. 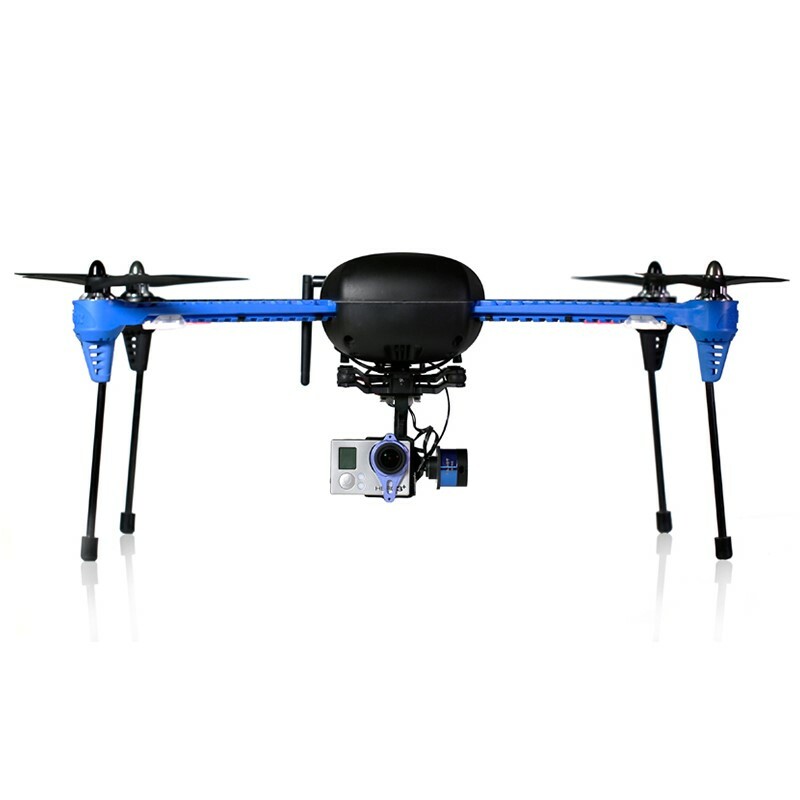 3D Robotics IRIS uses a stabilized mount to minimize camera motion during flight. Wind and Vibration. Not only is the drone travelling at a certain speed but it is flying in this constantly moving, turbulent sea of air. It is lurching up and down. Right and left. Tipping side to side. All at the same time. This motion kills resolving power. Detail that is needed to interpret features in the imagery and contribute to accuracy is increasingly lost. 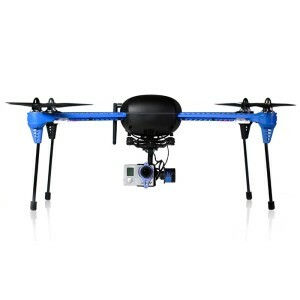 Some drones have stabilized mounts for their camera systems. Many drones do not. Stabilized mounts can provide stabilization in 2 directions or in 3. The best systems will provide 3-axis stabilization. Which of these stabilizing systems are needed for your application? Vibration is a different source of motion that can have very detrimental effects on image quality and resolving power. The drone engines are the primary source of vibration. 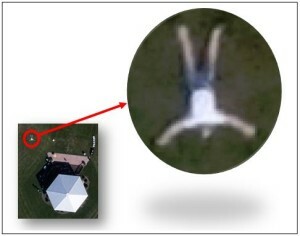 Depending on the drone model in use, vibration can be a major source of image degradation. For example, the Sensefly Ebee engines actually shut off just before image capture to eliminate vibration. Other drones have cameras mounted to the airframe on rubber bushings to isolate their sensors from sources of vibration. Ensure your drone has some effective camera mount that limits vibration. Any camera directly attached to the airframe could suffer important losses of resolving power. Metric Camera. A metric camera is one whose glass or plastic lens has been precisely measured to identify all distortions. These distortions bend incoming light and cause inaccuracies in the resultant picture. Camera lenses cannot be made distortion-free. Not only are there flaws in the manufacturing process but most lenses are intentionally designed to artificially bend light (Figure 3). The best and most expensive lenses have fewer distortions. Most cameras on drones are not metric cameras. The problem with non-metric cameras is that features in the image are not positioned correctly due to this arbitrary bending of light as it passes through the flawed lens and strikes the CCD. These distortions are very difficult to see with the untrained eye. But they are not trivial and can have a big impact on positional accuracy if uncorrected. Specialized image processing software is designed to take lens distortion information about a metric lens and “fix” the imagery. It will move pixels back into their “true” position as the image is created as if there was a “perfect” lens. Some drone systems use cameras with non-metric cameras and use sophisticated algorithms in their bundled image processing packages to model out much of this distortion. This is accomplished by precisely comparing where each feature is located in multiple overlapping images and removing the errors in these positions. Although this method may not be as effective as physically measuring distortion values in the camera lens, much of the image distortion introduced by non-metric cameras is reduced using software methods. As a drone operator or are buying drone deliverables it is imperative you determine if the image processing software bundled with your drone has these lens distortion-correcting capabilities. Figure 4. Dynamic range of the camera is a measure of sensitivity to light. This affects how much detail can be seen in light or dark areas as seen under the canopy in this picture. The picture on the right has much better dynamic range than the one on the left. Dynamic Range. Dynamic range is another important aspect of a camera system that can have a profound impact on the ability to interpret features in the imagery. Dynamic range is a measure of the camera’s sensitivity to light (higher is better). The ability to discern subtle tonal differences in dark (like canopy shadows) or bright areas (like reflective rooftops) is directly affected by dynamic range. 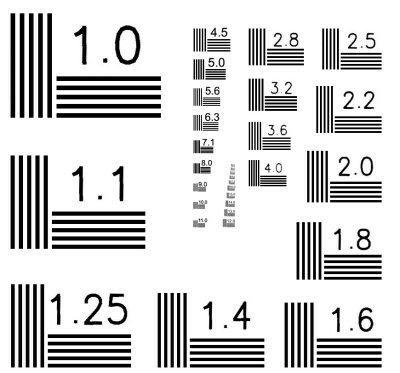 Exposure settings of the camera can certainly effect the dynamic range of a photo, but the sensor itself has a hard-coded dynamic range that effectively constrains just how much detail can be seen by adjusting exposure settings alone (Figure 4). Figure 5. The image (left) is a 4 cm GSD photograph taken by a quality drone camera at 400’ AGL. However, even though this is a very high resolution photo, the resolving power (right) has been impacted so severely that very little detail is discernable in the man’s features. High resolution does not automatically equate to high resolving power! Finally, it is prudent to mention a very common misunderstanding about image resolution (pixel size or ground sample distance GSD). Many people wrongly believe that high resolution imagery will have high resolving power (the ability to see tiny details). Although increasing resolution may generally be related to increasing resolving power there is no direct relationship (Figure 5). A high resolution blurry photo (due to excessive motion) with poor dynamic range will ultimately be a high resolution blurry photo with little discernable detail. It will have very poor resolving power. Do not make the false assumption the two always come together. The quality of the camera system and the crews operating skills while conducting the flight and while processing the imagery all have profound effects on the achievable resolving power of the imagery … even if it is super high resolution. Drone operators or firms procuring remote sensing and mapping services from professional drone operators should understand the importance of resolving power to their applications for the aerial photography. When procuring a camera system (drone + camera + software) it is important to ask the right questions to ensure the camera system’s performance will meet the intended use. Likewise, the professional procuring drone services should know what to ask the provider to ensure the deliverables are more likely to meet desired quality specifications.